A young woman seeking redemption helps a weary Wisconsin town rediscover its value while finding the meaning of home in the Department of Drama’s production of the 2001 Off-Broadway musical “The Spitfire Grill.” Based on Lee David Zlotoff’s 1996 film of the same name, “The Spitfire Grill” won the Richard Rodgers Award for New American Musical and was nominated for Best Off-Broadway Musical by the New York Outer Critics Circle and the Drama League. The Department of Drama production, directed by department chair Ralph Zito, runs at the Storch Theatre in the Syracuse Stage/SU Drama Complex from April 1-10. Upon finishing a five-year jail sentence, Perchance “Percy” Talbott heads to Gilead, a Wisconsin town whose beautiful natural surroundings she found a photograph of in a donated travel book. In the economically depressed town, Percy finds work at the Spitfire Grill, run by the bitter Hannah Ferguson, who has been trying to sell the Spitfire Grill and start over. When Percy comes up with the idea of having a nationwide raffle and essay contest to find a new proprietor, she and the town learn that, in order to have a brighter future, one must first move on from the past. 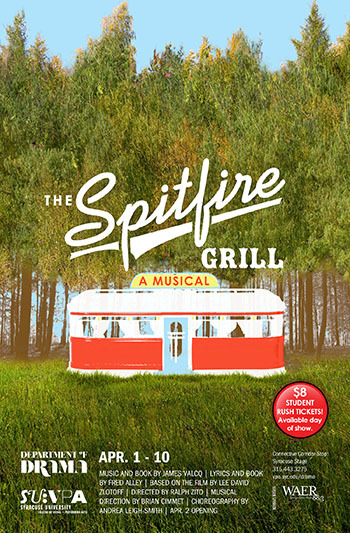 The story of “The Spitfire Grill” has drawn widespread praise for its heartening take on the human spirit and its beautifully crafted score. “From the first notes of the opening song ‘Ring Around the Moon,’ right through to the uplifting end of the show, the score is a pure delight,” BroadwayWorld.com reported. For the role of Percy, Zito needed an actress who could convey the emotionally shut off Percy’s inner life without being shut off from the other actors or the audience. “It’s a challenging line to walk,” acknowledges Zito. Of all the characters in the musical, Percy sings more than anyone. “I needed somebody who could really animate and really come into what was going on for her musically. The particular sort of folk inflection of the music creates certain demands in the singer’s tone and their ability to express through that tone and through that medium,” says Zito. The set designs of previous productions of the musical focused principally on the diner itself. But Zito and his set designer, Mary Olin Geiger, an alumna of the Department of Drama, purposely decided to make the woods surrounding Gilead a constant presence for the Department of Drama’s production. “The woods and the surrounding area is as much, if not more, the heart of the story,” says Zito, “It is the woods that heals Percy.” And it is Percy’s relationship to the woods that ultimately transforms the people of Gilead as well as their perception of their home. Zito has served as department chair for the Department of Drama since 2010. Before coming to Syracuse, he was chair of Juilliard’s Drama Division, as well as a professor in the school’s voice and speech department. The design team includes Mary Olin Geiger (scenic design), Katie Tulin (costume design), Emily Stork (lighting design), and Kevin O’Connor (sound design). Bianca Boller is the stage manager.